The quantity of elements which compose our planet is incredible but often it appears as we can’t grasp or fully appreciate them due to our inability to push our mind beyond; If we could only sometimes free ourselves from any block or limitation and deviate our perception in a mental dimension, maybe we would expand our horizons and extend our perceived impressions, enjoying life more extensively. Art helps us in this by teaching us how to pick different aspects , even the most banal ones of our everyday life which we generally neglect but which can be the most interesting and surprising. As Chagall used to claim, with the characters, the animals and objects which populate his landscapes: the artist challenges the laws of gravity, he sets us as visitors with an unusual perspective; “I dive into my reflections and I fly above the world” he writes and tells about in his paintings. It’s an upside-down world, “ a man walking needs to mirror himself into a his opposite to underline his movement” exactly as “ there isn’t a vertical vase, it is necessary for it to fall in order to prove its stability” the artist would write. 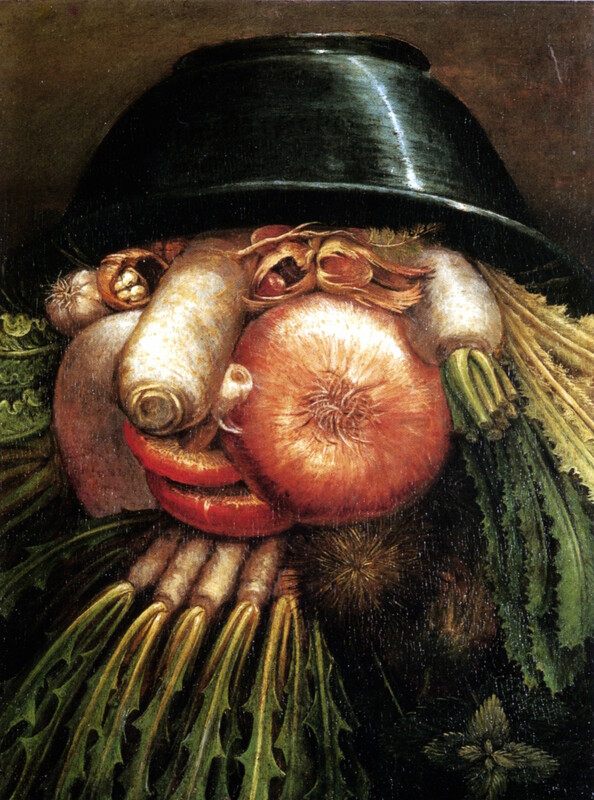 We can perceive in the same way “L’ortolano o Ortaggi in una ciotola” by Giuseppe Arcimboldo, the painting demonstrates how turning an image upside down puts up a whole different picture. To look at this image, on the contrary, we need to imitate the subject of the painting “the world upside-down” by Chagall: bend your head upside-down and enjoy your perceptions. The video created aims to be a philosophical interpretation of the way we see things inspired by art and its greatest interpreters. Given the infinite number of perceptions which can be cought in our lives, we offer our personal reinterpretation of Chagall and Arcimboldo. We propose videos shoot in our hometown to highlight that a person can reach such a level of creativity that can even perceive a world parallel to ours, made of pictures generated by reflections and shadows. the video is matched with a set of unusual sounds that bring us into a different dimension, the dimension of mental subconsciousness, a process that takes place inside our minds. The ambiguity given by the falling vase, that falls multiple times but never breaks, is also a reference to Chagall quotes: “ a vertical vase does not exist, it is necessary for it to fall in order to prove its stability”. And if it does not break that’s because we are in a different dimension in which we don’t know which is the right way and that’s exactly the reason why the vase cannot break. Ambiguous is also the proposal aimed at believing that the thought of who observes the flow of images could have its own free and personal interpretation.